Lewis Hamilton has taken back-to-back pole positions in 2016 by beating his teammate in qualifying for the Bahrain Grand Prix. Formula One was spared the full embarrassment of its new qualifying format by both Mercedes and Ferrari sending out its drivers in a straight duel for pole, though Hamilton was confirmed as the fastest man with more than 90 seconds remaining on the clock. The Briton’s first lap in Q3 left him in fourth after he ran wide at the last turn, but a perfect second run was enough to vault him past Nico Rosberg by a barely significant 0.077 seconds. 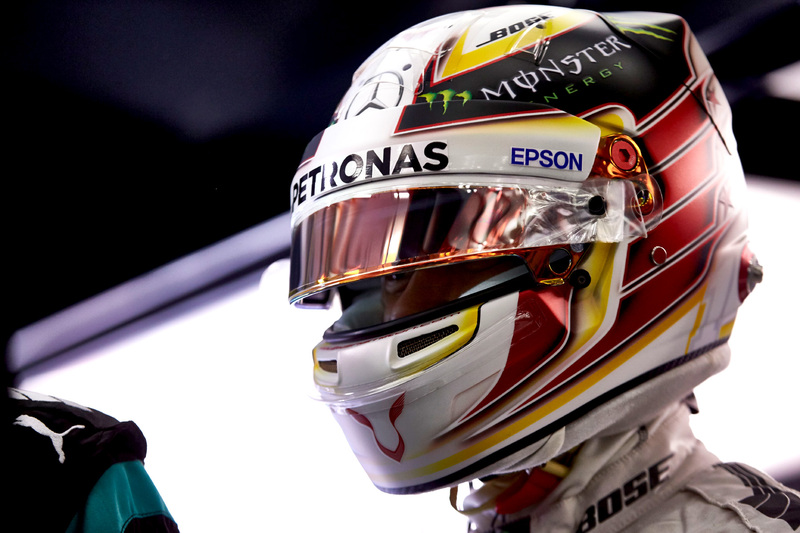 Hamilton set a new overall lap record for the Bahrain International Circuit, his 1:29.493 eclipsing Mark Webber’s 1:29.527 set in fourth practice in 2005 at the height of the nostalgic V10 era. Mercedes teammate Rosberg said he is looking forward to a race which he believes does not prioritise a pole-position start. The Ferraris of Sebastian Vettel and Kimi Räikkönen temporarily looked to spoil the Mercedes party after Hamilton’s misjudgement, but Vettel’s fastest lap ultimately fell half a second short of the session’s benchmark, with the Finn a further two-tenths back. “I was very happy with the first attempt,” said Vettel. “My second attempt was more or less copy-paste — I thought there was a little bit, but five-hundredths wasn’t enough if they improved by half a second! Daniel Ricciardo in his Red Bull Racing RB12 was the next-best driver, his Renault-powered car again proving surprisingly handy despite the team’s pre-season misgivings over the French firm. Better still, the Australian, who was 1.3 seconds off the pace, outqualified Williams pair Valtteri Bottas and Felipe Massa by 0.3 seconds. All three were eliminated from qualifying in their garages, well after completing their sole laps. Nico Hülkenberg was the only other driver in the final segment of qualifying, but the Force India car proved slowest of all after the top eight cars set their first timed runs. Spicing up the show, the red light at the end of the pit lane refused to change to green to signal to the drivers the start of the session, depriving the growing queue of cars more than a minute of segment two. Daniil Kvyat again fell foul of the new qualifying format, knocked out almost immediately in Q2 in fifteenth after the order shuffled through every driver’s first lap. Jenson Button’s McLaren was eliminated in fourteenth, followed by Haas’s Esteban Gutierrez in thirteenth. Fernando Alonso’s car, piloted in Bahrain by McLaren reserve drive Stoffel Vandoorne after the Spaniard was found to have a fractured rib and partially punctured lung from his crash in the Australian Grand Prix, was eliminated from his garage in twelfth 90 seconds later. Meanwhile Toro Rosso’s Carlos Sainz and Max Verstappen and Haas’s Romain Grosjean were preparing to change out of their overalls despite five minutes remaining on the clock. Force India’s Nico Hülkenberg was left as the only driver circulating on track, which pushed him from the knock-out zone and into eighth — quick enough for the top-eight Q3 — and setting the Q2 order at Grosjean, Verstappen and Sainz in ninth, tenth, and eleventh. The first segment of qualifying in Bahrain looked much like it did in Australia, with all cars taking to the track in the opening minutes on the supersoft tyre — Pirelli’s softest compound at this circuit in 2016. Felipe Nasr bit the dust first — the Sauber driver was in the process of completing a hot lap when his 90 seconds expired — while Rio Haryanto was eliminated next, the Indonesian dealt P21 from his Manor garage. Renault’s Jolyon Palmer was eliminated in in P20. The Briton timed his lap perfectly to avoid his 90-second elimination, but he failed to piece together a fast enough time to outqualify teammate Kevin Magnussen, who was eliminated in nineteenth place. Magnussen, however, will start from pit lane after being penalised by the FIA for failing to report to the weighbridge during Friday practice. The revised qualifying format again delivered a major scalp in Q1 when Force India’s Sergio Perez mistimed his lap after Manor’s Pascal Wehrlein put in a last-gasp hot lap to jump the Mexican and put him in the drop zone. Perez was preparing to set a lap when he was given the news, but there wasn’t enough time remaining for him to complete it. The first qualifying segment then fizzled out — just as it felt it was warming up — with Sauber’s Marcus Ericsson and Wehrlein being eliminated from their garages in seventeenth and sixteenth. The track fell still with about a minute remaining on the clock.